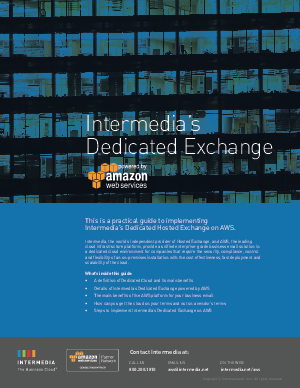 This is a practical guide to implementing Intermedia’s Dedicated Hosted Exchange on AWS. Intermedia, the world’s largest independent provider of Microsoft® Exchange-as-a-service, leverages the AWS Cloud to provide Dedicated Exchange on AWS. Exchange on AWS brings the best enterprise-grade cloud infrastructure platform to your business email. AWS has been engineered for the most demanding requirements and regulations, including HIPAA, SOC, PCI, among many others. — Hal Bennett, General Manager of Global Technology Partners, Amazon Web Services, Inc.